The mesmerizing beauty of the Hawaiian Islands is a resplendent backdrop to the uninterrupted views and resort style living experience offered by this elite new residence, which can be considered as one of the ultimate luxury beachfront homes available in the world today. This impressively architected residence features a 2-storey Grand Room with an incredible remote-controlled 18-foot high African Sapele wood 90-degree corner, dual pocket door window wall system, that when opened, blurs the division between indoor and outdoor living, engulfing the residence with a wealth of sunlight, cool sea breezes and dramatic picture perfect postcard framed ocean vistas. Living in this luxury residence provides the unique experience of being on vacation without ever leaving home. The 28,000 sq. ft. pristine oceanfront property enjoys 120 linear feet of beach frontage with an in-ground cascading wet-edge infinity pool and spa deck. This unparalleled luxury residence is a fully furnished private retreat that captures the true essence of the Hawaiian Island style with its own compelling individual allure and inspiring distinction. Contemporary architectural masterpiece by award-winning architect, Jeffrey Long, acclaimed in Hawaii and CA. Pristine beachfront land of 28,000 sf (2601 sq. meters) with 120 linear ft. (36 meters) beach frontage close to championship golf courses. Details include 18-foot disappearing Sapele glass pocket doors, custom gourmet kitchen, and infinity edge pool all overlooking beautiful blue ocean views. 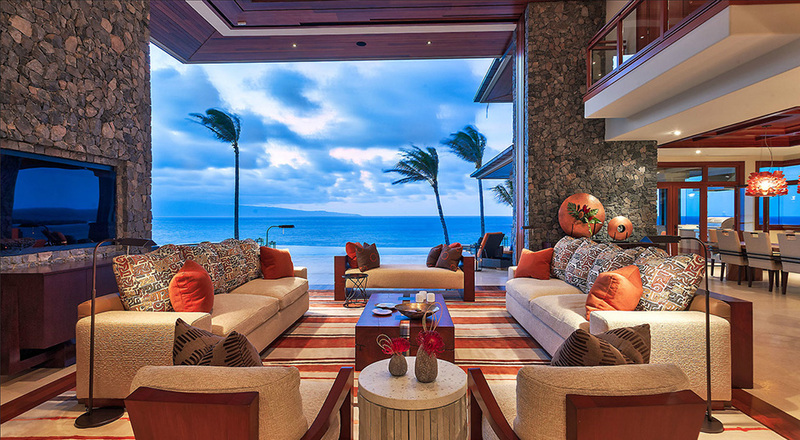 It’s true resort living in the ultimate beachfront location in Hawaii! Contact us today to book your stay at this incredible luxury beachfront Hawaiian property on the beautiful island of Maui. 6 (and a half) Bathrooms. Living Area 6,630 Sq. Ft. Covered Area 1,261 Sq. Ft.
Land Area 28,001 Sq. Ft.
In-door and out-door pool and spa. One of a kind oceanfront and beachfront property. Built in gym and library.